This weekend is Labor Day. Unfortunately and surprising, there doesn't seem to be a modern, award winning, high quality full length documentary on the history of labor in the United States. It's so bad, it's difficult to find any labor history made past the 1980's. Amazingly enough, people are not being informed how labor gave most Americans the quality of life and employment rights most take for granted today. Next up, first up is a playlist (it will play continuously) of the History of Labor in the United States. This next clip will kill you. Most meatpacking jobs are now filled with illegal labor. 1990's - "Must be Union Free"
Fast forward to where we are today....9.1% unemployment, high skilled jobs offshore outsourced, factories so moved offshore, so the entire nation looks hollowed, the bringing in cheap labor, illegal or on guest worker Visas, the biggest spike in part time labor, record income inequality, repressed wages, poverty dramatically spiking, all the while huge political forces try to blame labor for the current economic problems of the United States. With that, this is a labor history film from 1964, The Inheritance. The film was originally made for the Amalgamated Clothing Workers of America and the film producers made it publicly available due to the recent attacks on organized labor and the very important right to collective bargain. Lots of rare stills, clips & photos from working and living conditions before labor became organized. Honorable mention, the History Channel does have a series of short video clips on labor. Please share any labor documentaries you have and your thoughts on anything else in the comments. Jphnny Paycheck "Take This Job"
Remembering the 1970s when there still were working-class heroes -- here's the song that inspired a film in 1981, 'Take This Job And Shove It', by David Alan Coe (1977), famously recorded by the late great Johnny Paycheck. Snapshot (right) taken at Gilley's Nightclub, 1 March 1978. 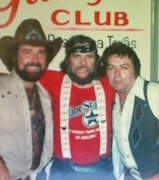 Johnny Paycheck with Johnny Lee (left) and Mickey Gilley (right). 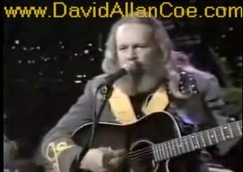 Link to Wiki article "Johnny Paycheck"
With all due respect to the late great C & W singer, Johnny Paycheck (Donald Eugene Lytle, 1938 - 2003), here (left) is poster from available-free video at YouTube, 'Take This Job And Shove It', as performed by David Allan Coe and band in 1983. And here's commentary by Jim Goad, from the chapter “Playin’ hard” from “The Redneck Manifesto", quoted by way of a CRACKED webzine, at webpage titled "Why Country Music Is Better Than Punk pt.2"
Country music is trauma music, with more booze, drugs, and murder than all other pop formats combined. More rubbed-raw emotions. More take-this-job-and-shove-it worker rage, too. For all its alleged reactionary spirit, country-and-western-lyrics address the indignities of working life far more than any other pop-format. I think of Johnny Cash gulping down a bottleful of pills a day and tearing down hotel walls. The lonely heart-attack of Hank Williams in the back seat of that taxi. ... Tammy Wynette stumbling down a rural road dazed and covered in bruises. Entertainers, all of them. People who brought happiness to others. Miserable.